Have you ever walked down the ‘baby section’ in supermarkets? There’re wipes upon wipes lining each side! The options are simply too many to choose from, right? But then how hard could it be to select baby wipes! Well, wait until your baby is left with a red, burning bum. One thing synonymous to #momlife is lots & lots of diaper change! And that’s why you need a heap of baby wipes close at hand. But the fact that a newborn’s skin is extremely delicate, it’s so easy to irritate it. And add to this the fact that some baby wipes contain chemicals that are too harsh for an infant. What can you do to safeguard your child’s sensitive skin in such a case? Well, you can stock up on these 5 Best Baby Wipes for Newborn babies sensitive skin. This brand comes with mum-baby friendly, toxin free, international standards compliant range of baby products. 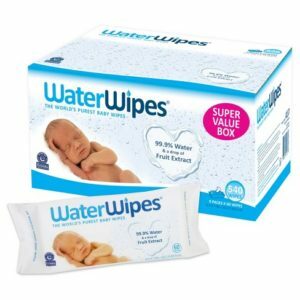 The ingredients used in Waterwipes are….well, as the name suggests, water! Yes, the brand claims to contain 99.9% purified water making them ideal for newborns! The mild ingredients in these water wipes ensure nil irritation even with regular use of these wipes. The wipes are fragrance and alcohol free with a drop of fruit extract making them an ideal alternative to cotton wool and water. The packaging is also quite user-friendly. The plastic flip-top lid reduces loss of moisture and keeps the wipes fresh & wet all the time. Overall, it is considered as one of the economic, safe and 100% biodegradable wipes available in the market today. Learn more about it here. In love with everything herbal? This brand cannot go unnoticed in such case! bacteria throughout the day. I felt very comfortable using them on my infants as soon as we came home from the hospital. 4. Pampers Sensitive Baby Wipes I like that Pampers is a brand that wins one’s trust and that its sensitive formula is fragrance free. Pampers Sensitive Baby Wipes are not only perfume-free, but are hypoallergenic and are very mild. There is also a special ingredient in them to help restore the pH i.e natural moisture of the baby’s skin, which is helpful when bottoms start to get red and irritated because of nappy rashes. The packaging is also intelligent and user-friendly. The flip-top lid prevents moisture loss and makes it a handy option while on-the-go! Another brand I’m in love with specially when it comes to all things natural for my baby! Babyganics has awesome and really effective wipes. These are fragrance-free and work magically on bottoms that are prone to diaper-rash. With its primary ingredients being natural, Babyganics wipes work well in cleansing & moisturising your baby’s most delicate areas. Each of the products I reviewed is a favourite of moms everywhere. With sensitive baby skin it’s imperative to use something as gentle as mom’s touch. So pick the best baby wipes for your little bub. « Are you Force Feeding your Child?